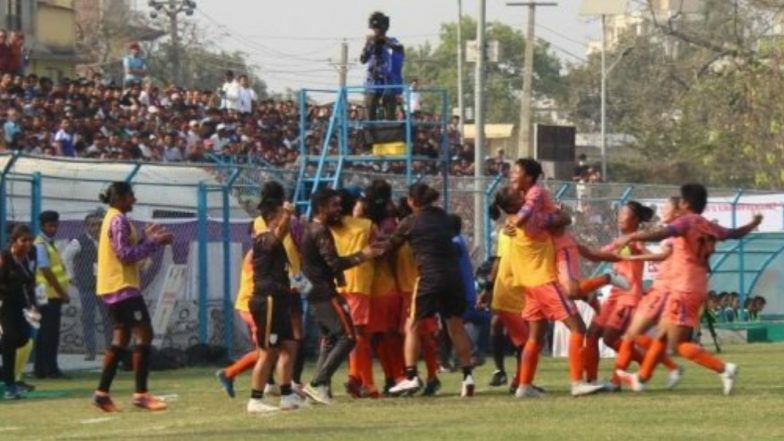 Biratnagar, March 22 (IANS) India continued its dominance at the SAFF Women's Championship with the team lifting its fifth straight title on Friday in Biratnagar, Nepal with a 3-1 win over the hosts in the final. The win extends India's unbeaten run in the tournament's history to 23 games as goals from Dalima Chhibber, Grace Dangmei and substitute Anju Tamang saw India lift the trophy in front of a partisan crowd at the Sahid Rangashala Stadium. Just three minutes later, after some excellent build-up play down the right, Sandhiya laid off a ball for Sanju to shoot from the top of the box. The winger's effort was a powerful one but was saved by the opposition keeper. On the other end, Sabitra Bhandari posed a threat for India inside the penalty area but her curling effort was off target. Sunil Chhetri Dubs Bengaluru FC’s Maiden Indian Super League 2019 Title Win As ‘Special’. The winger swiftly broke through and showing great composure, she rounded the goalkeeper and slotted the ball home to restore India's advantage. It proved to be the straw that broke the camel's back as the away side continued to keep the Nepal side at bay and almost added another as Ratanbala's shot was spilled by the keeper. Bangladesh Arrests Female FIFA Official for Criticising PM Sheikh Hasina.